No man is a hypocrite in his pleasures, Dr. Johnson informs us. In a somewhat similar vein, the Regime’s post-9/11 “counter-terrorism” stings have avoided the official fiction that Muslim terrorism is inspired by a hatred for our “freedom.” The preferred bait to lure marginalized Muslims — many of whom have little commitment to the faith, no detectable terrorism-related skills, and abundant personal problems — is outrage over the Regime’s imperial foreign policy. As Scott Horton of the invaluable Antiwar Radio has pointed out, the scripted patter of federal provocateurs doesn’t focus on America’s refusal to submit to Sharia, or our decadent popular culture. In seeking to attract potential recruits, the Regime’s agents invoke the plight of besieged Muslims in Afghanistan, Iraq, Pakistan, the West Bank, and elsewhere — people whose sufferings are either inflicted or underwritten by Washington. A key admission of this fact is found in the official press release announcing the arrest of the so-called “Newburgh 4,” a group of ex-convicts from New York accused of plotting to bomb a synagogue in the Bronx and attack military aircraft at a nearby Air National Guard base. Despite the fact that Cromitie wasn’t particularly devout, Hussein was able to radicalize him by dwelling on the human cost of Washington’s war on Afghanistan. It’s reasonable to suspect that the devotion expressed by Cromitie and his friends had at least something to do with the material blandishments offered by Hussein, such as at least $25,000 apiece (and as much as $250,000 to one of them) if they cooperated in his plot to plant a bomb at a synagogue and fire Stinger missiles at military planes. The devoted Muslims attending the mosque wisely shunned Hussein’s company after he described himself as a representative of a Pakistani terrorist group called Jaish-e-Mohammed. The four guys he managed to snag as patsies appeared to know next to nothing about the Muslim religion. In fact, it was the petty crook the Regime hired to be a provocateur who had to teach Cromitie how to lead the members of his “jihadist cell” in prayer. “Should I do that real quick?” asked “cell leader” Cromitie in a recorded exchange with Hussein. “Lead it loud, so everybody can understand,” replied Hussein, who was actually directing a performance rather than gathering evidence of a criminal conspiracy. In similar fashion, Hussein “often seemed eager in the recordings to remind the men of their extremist sponsors while discouraging the idea that money should motivate them,” observes a New York Times report of the trial. During meetings in the house rented by the FBI to serve as a mise-en-scene for the federally scripted production, Hussein repeatedly invoked Jaish-e-Mohammed, an organization completely unknown to the “conspirators” before the provocateur brought it up. “It’s not about money,” insisted the Pakistani crook to the people he had targeted. “It’s about Jaish-e-Mohammed.” Actually, for Cromitie and the others, it was “about the money.” They had no interest in, or inclination toward, terrorism until they had been seduced by promises of easy money to be earned in “paying back” those they considered responsible for attacking Muslims abroad. As Hussein’s FBI handler Robert Fuller noted, by way of reassuring security personnel at Stewart Air Force Base, Cromitie “would never try anything without the informant with him.” Nonetheless, Hussein did everything he could to push a balking and puzzled Cromitie into an out-front role as the “leader” of the supposed plot. “I’m not running the show, he’s running the show,” Hussein repeatedly told the others with respect to Cromitie’s purported leadership. Cromitie’s sense of unease grew to such an extent that he actually wanted to bail out of the plot when he detected a federal “tail” while en route to pick up the (disabled) Stinger missiles. He was aware that he and his colleagues were being watched. However, for some reason Cromitie didn’t connect that fact to the way he had been cast as the “leader” by the big-talking stranger who pushed him to the front of the supposed plot. What this means, of course, is that the Feds are, once again, prosecuting people for allegedly taking part in a “plot” created by the Feds — a plot they were invited to join by a Federal asset who urged people to be angry over atrocities being committed overseas by the same Federal Government. 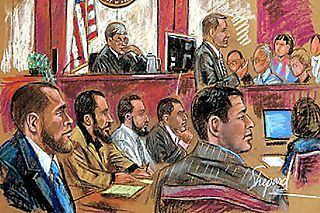 The “Newburgh 4” plot is so obviously an FBI production that U.S. District Judge Colleen McMahon, who is presiding over the trial, admits to referring to it as “the un-terrorist case.” It is hardly unique: This little melodrama was created from the same template used to create the “Fort Dix 5,” the “Miami 6,” the “Liberty City Seven,” the so-called Michigan “Ummah” conspiracy, and other groups. 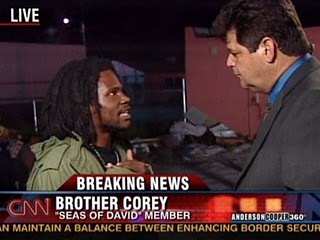 In each of those cases, the Feds dipped into their vast pool of criminally compromised informant-provocateurs, rented a meeting place, supplied the funding and hardware, and gathered a handful of pathetic flunkies into a telegenic terrorist “threat.” Most importantly, the Feds, by way of their hired provocateurs, selected a grievance they knew would radicalize their recruits — a jihad to avenge the deaths of innocent Muslims abroad, not to punish infidels at home for their refusal to submit to Islamic rule. In ritualized remembrances of Black Tuesday, no mention is made of what happened on that date eleven years before “The Day the World Changed.” On that date the first President George Bush, invoking the supposed authority of the UN Security Council, outlined his vision of a “new world order” in an address before a joint session of Congress. The path to global hegemony, as described by Bush pere, would run through the Middle East, and following it would mean slaughtering tens or hundreds of thousands of Muslims — through invasions, embargoes, and intermittent bombing campaigns. It also meant absorbing huge populations of Muslim refugees from Somalia, Iraq, and other countries blessed by Washington’s peculiar armed humanitarianism. One predictable result, as noted in a report on “homegrown terrorism” compiled for the Bipartisan Policy Center by veteran Establishment drones Tom Kean and Lee Hamilton, is “the increasingly prominent role in planning and operations that U.S. citizens and residents have played” in jihad-related activities. This doesn’t refer only to the FBI’s prefabricated terrorist “plots,” but also to involvement by American Muslims in foreign armed insurgencies against the U.S. military and Washington’s proxies. “While it is perhaps tempting to dismiss Shahzad’s threats as the irrelevant ranting of an incompetent wannabe terrorist, he and his likely successors present the most serious challenge to the security of the U.S. and the safety of its citizens since the September 11, 2001 attacks,” conclude Hamilton and Kean. We shouldn’t be surprised that Hamilton and Kean studiously avoid the obvious: The people running the Regime’s security organs agree with Shahzad’s analysis completely. They know that it is Washington’s foreign policy, not the Koran, that inspires contemporary Muslim terrorism. Those people understand how to create and exploit enemies. The all-but-unspeakable truth we should ponder on today’s grim anniversary is that the Regime is willing to permit those enemies to slaughter Americans by the thousands in the service of its interests.